Why has the relationship between video games and the world's most popular film franchise become so strained? Yesterday, Disney announced it would be departing from video games altogether in the wake of a disappointing revenue shortfall for which Disney Interactive has been largely culpable. It's a tale as old as time, song as old as rhyme: Corporate conglomerate gets into video games, overextends its reach, and retreats in a panic at the first sign of trouble. Given the Hollywood rivalry between Disney's Marvel group and Warner's DC division, there's a certain irony in watching Disney follow so closely in Warner's footsteps — it was Warner, after all, whose purchase of (and failure to properly manage) Atari in the ’70s and ’80s precipitated the infamous U.S. console crash more than three decades ago. So much for blazing trails. Any amusement that might come from Disney's failure to learn from history is ultimately muted by the realities of Disney's hasty departure from the games business, which includes the loss of hundreds of jobs. The corporation's massive tax write-off involves closing developer Avalanche, an uncertain future for Disney's vault of LucasArts games, and the immediate discontinuation of the Disney Infinity game and toy line. Infinity's death comes as perhaps the biggest surprise; while the toys-to-life market has grown increasingly crowded, Infinity was arguably the best of them, offering solid game design, a line of figures recognized around the world, and a reasonable price structure. Not only that, but Infinity was the only way for gamers to play through a movie tie-in to Star Wars: The Force Awakens back when the film launched in December. Somehow, though, even Star Wars couldn't save Infinity. Then again, Star Wars and video games seem to have succumbed to a surprising estrangement in recent years. Within a year or so of The Phantom Menace's 1999 release in theaters, we had roughly a half-dozen games ranging from a racing game, two general standalone action adaptations, a shooter, and even a video pinball tie-in. The Force Awakens, on the other hand, has to date seen a module for the plug-and-play Infinity platform and a single Jakku map for Star Wars: Battlefront, which doesn't touch on the movie at all but simply lets players take part in a battle set long before the events of the film. Next month sees the arrival of LEGO Star Wars: The Force Awakens, which seems likely to amount to little more than a reskinning of the standard LEGO game model, which means it would offer the same general play experience as the Infinity module. 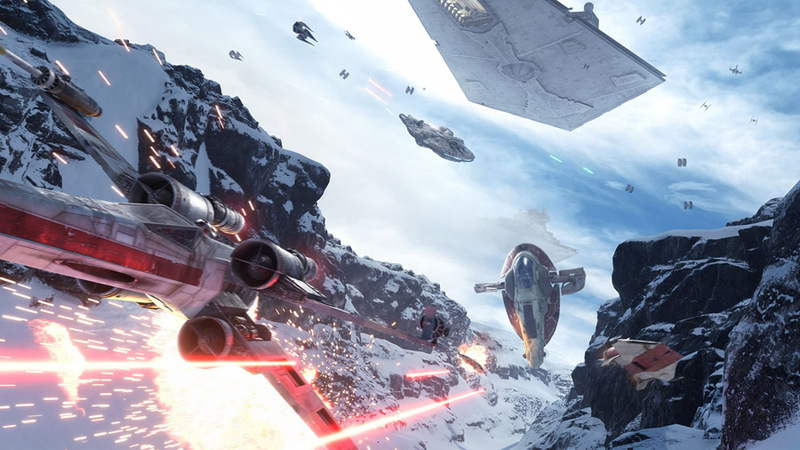 Star Wars: Battlefront has its moments, especially when dogfighting is involved... but for fans in search of a meaty new single-player experience, these aren't the modes you're looking for. Still, there's no shortage of Star Wars in video games; within the past week Respawn Entertainment and DICE have announced upcoming projects. Yet the once-close relationship between the two has grown far more distant than it used to be. 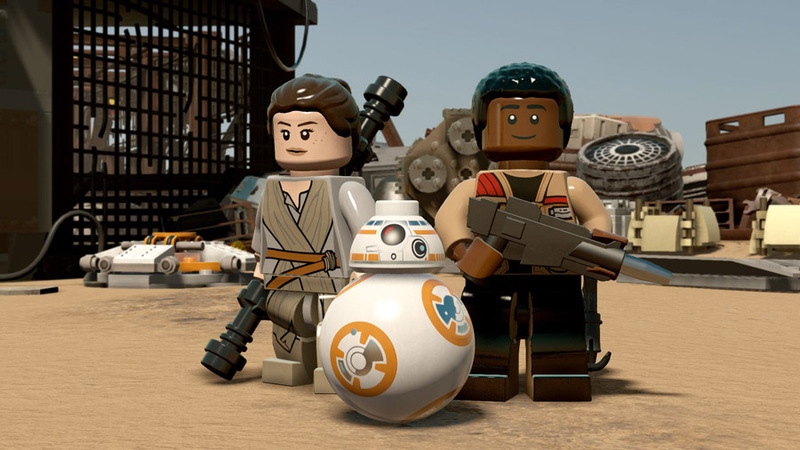 Original spin-offs and standalone film adaptations have given way to template-based franchising; with Infinity, LEGO, and Battlefront alike, developers have simply shoehorned The Force Awakens content into their standard, existing, formulaic frameworks. Respawn's upcoming project could potentially turn out to be something more ambitious, but we've come a long way from the days when our Star Wars game options consisted of top-shelf original works like X-Wing Vs. TIE Fighter and Jedi Knight. What happened to Star Wars games? Well, basically, Disney happened. When Disney took control of the Star Wars license, its first act was to clear the board of Star Wars "expanded universe" content such as novels, comics, and spin-off games, creating a clean slate for its line of film projects. The upcoming Rogue One will tell the "definitive" tale of how the Rebel Alliance acquired the plans for the original Death Star, a story that has been told more than half a dozen different ways already in Expanded Universe projects. 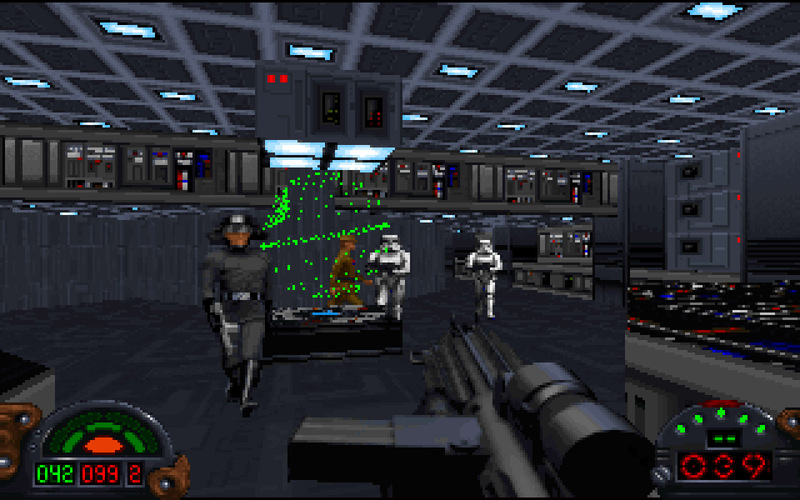 Heck, Star Wars: Dark Forces, the FPS that launched LucasArts' string of brilliant Star Wars games throughout the ’90s in the first place, used protagonist Kyle Katarn's acquisition of the plans as its opening mission — a mere appetizer before getting into the game's real story. By wiping out decades' worth of what amounted to professional Star Wars fan fiction, Disney has given itself room to explore those stories in greater depth... not to mention greater refinement. The excellent Dark Forces used the entire plot of Rogue One as a prologue, so Disney erased it. Although there's a dude who looks like Kyle Katarn in the trailer, so... maybe there's hope? The unfortunate side effect of this choice, however, has been to stifle the periphery of the Star Wars universe. The little nooks and crannies that Star Wars games used to occupy have been sealed away, reserved by Disney for possible cultivation at a later date. It's a sort of creative gentrification, as the corporation bulldozes years of ramshackle work in order to clear out space for the gleaming new towers of infinitely merchandisable feature films... at least until the day when Star Wars loses its value as a brand and Disney cuts it loose they way they've canned Infinity, anyway. While you could argue not much of value has been lost now that questionable material like The Courtship of Princess Leia and Star Wars: The Force Unleashed has been stricken from the record, Star Wars has suddenly ceased to be an interesting playground for anyone but Disney's appointed brand stewards. Of the current and upcoming roster of Star Wars games, we have two kid-friendly retellings of The Force Awakens, an apocryphal, story-free team shooter set in the films' most interesting battlefields, and a mystery project from Respawn. What we don't have are games that tell an original story, offer an interesting take on obscure corners of the Star Wars universe, or even retell The Force Awakens in a purpose-built engine. Video games have become an afterthought for Star Wars: A revenue stream, but one with no autonomy. There's a deeper incompatibility at work here as well. Games take much longer to create than ever before, with big-budget games by a single studio typically appearing on the same three-year cycle as blockbuster movies. Meanwhile, Star Wars films — which more or less created that very three-year cycle — have become a franchised work assembled by separate teams on overlapping schedules. Where games used to come out annually and Star Wars flicks showed up every three years, that pattern has inverted, with the movies now seemingly running on an annualized holiday schedule. Modern games also demand the same level of resources as movies, with budgets frequently adding up to that of a tentpole Hollywood release. LEGO Star Wars: The Force Awakens is cute as a button, but it seems likely to retread a lot of the same ground as the Force Awakens module of Disney Infinity... not to mention every other LEGO game to date. In short, Disney has made Star Wars more nimble — witness rumors of rewrites and reshoots for Episode VIII that give breakout characters from The Force Awakens like Finn and Poe Dameron larger roles — while video games have become more sluggish and inflexible. Where developers could reasonably create a fairly good-looking PlayStation 1 or 2 release in parallel with the production of The Phantom Menace or Revenge of the Sith and have those games available at those movies' debut, the franchising of Star Wars and the complexities of HD-era game development make that impossible. Infinity's The Force Awakens material was amusing and fun, but also incredibly brief — a five, maybe six hour experience in total, if you really stretched it out. I don't doubt the difficult realities of game development, and the resulting misalignment between game production and Disney's aggressive Star Wars film schedule, played a huge part in the corporation's decision to drop its Interactive division in favor of farming out Star Wars games to other studios. Really, we should have seen the writing on the wall when Warner announced LEGO Star Wars: The Force Awakens, given that the LEGO franchise includes Dimensions, a direct competitor to Infinity. Handing your rival the keys to the coolest car in your garage doesn't precisely say, "We're in this race to win it." If there's a bright side to the dissolution of Infinity and Avalanche, it's that other developers seem far more likely to be able to handle the Star Wars license than Disney was. The notoriously risk-averse company didn't want to take any chances when it bore the cost of turning Star Wars into video games alone... but in the role of licensor, with the brunt of potential failure falling on other publishers and developers? That should free up Disney to take some creative chances with the Star Wars brand... or, failing that, at least to give a nod to something more interesting than the current roster of toothless Star Wars projects. Tagged with Action Adventure,	Analyses,	PC,	PlayStation 4,	Shooters,	Star Wars,	Xbox One.